In this issue's cover story, you'll follow Angelo Gaja's amazing trajectory-where he came from, what he accomplished, and where he and his family go from here. You'll find much more Italian coverage in this special issue. Wine Spectator's Bruce Sanderson offers his analysis of Tuscan wines in a comprehensive tasting report. Also, Senior tasting coordinator Alison Napjus has tasted more than 600 wines from the northeastern Italian districts and found plenty of food-friendly, good-value bottles. You'll find recipes for fantastic Ialian food as well. 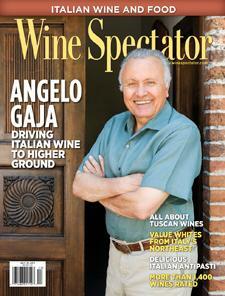 We're pleased to note that Wine Spectator has released its first publication for the Apple iPad. It's an authoritative, interactive guide to Napa Valley, available through the iTunes store.